In 2014, I wrote an article for this website called “Get Real – Mayweather-Pacquiao Would Not ‘Save’ Boxing.” In it, I challenged the notion that Mayweather –Pacquiao – or any other superfight for that matter – really benefit the sport beyond the fight itself. Most comments were negative. I was an brainless dipshit, totally ignorant in all things boxing. May-Pac would produce the kind of long-term attention that fights such as De La Hoya-Trinidad, Lewis-Tyson, Hopkins-De La Hoya, De La Hoya-Mayweather, Mayweather-Alvarez, etc. had not. Because – like, duh – MayPac would be BIGGER. Well, no denying that. As predicted, it WAS bigger. But I still say that events like this do NOT benefit boxing. And now I will finally learn if my long-standing opinion is erroneous, or as factually accurate as the PPV numbers. I’m excited for the answer. If boxing sees an overall spike in viewership following this bout, then I will have to concede my point and admit that superfights do indeed benefit the sport on the whole. If this bump extends to other fighters beyond Mayweather and Pacquiao, then I will humbly admit my error. The only two men who can crack 1 million PPV buys will soon retire – we need other fighters who can step up. But if the biggest event in boxing history can’t prevent figures from returning to normal, then the opposite must be factually true – superfights, no matter how big, do NOT have the impact they’re supposed to. In other words, it’s not a size issue. They can’t get any bigger. I still hold that to be true. I personally enjoyed MayPac, but I can understand why a lot of blood-and-guts fans hated it. No bout short of a Rocky film could have matched the expectations that promoters built. I also hold that boxing does not need one big fight. It needs dozens of fights, period. Baseball is more than the World Series. Football is more than the Super Bowl. Soccer is more than the World Cup. Basketball is more than the playoffs. These sports maintain relevancy because the fans have access to run-of-the-mill “ordinary” matches/games that do not have the world riding on them. In this way, the sport becomes part of the fan’s diet. Despite his emerging reputation for underhanded evil, I think Al Haymon’s move to broadcast on free TV is a far better step in the right direction. The fights which made a boxing fan of me – like Ward-Gatti, for example – were not on PPV. They were not hyped or promoted to a hundredth of the degree that Mayweather-Pacquiao was. And yet they threw a fight many times better than what we saw Saturday night – a fight most would-be boxing fans missed. 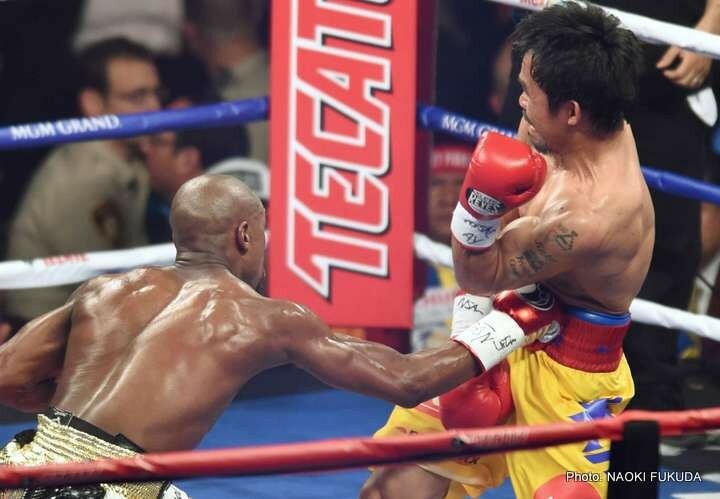 Next boxing news: Mayweather vs Pacquiao: Where next?